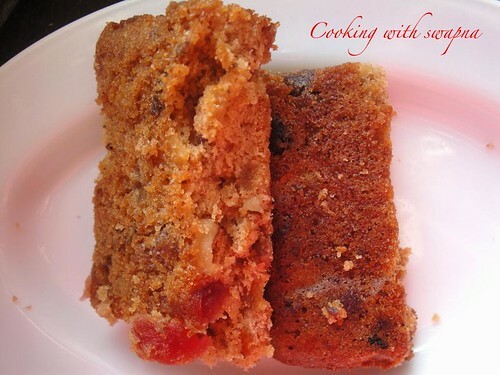 Fruit cakes are normally baked during christmas & New year seasons. I soaked the nuts & dried fruits in whisky overnight. 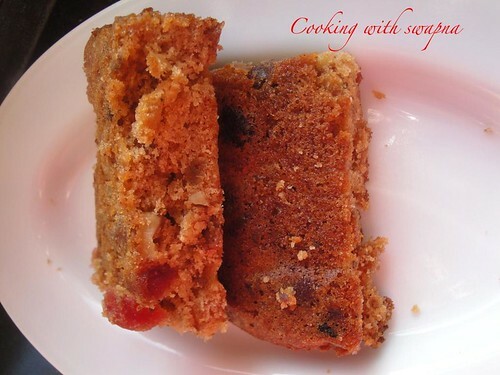 Flavour of soaked nuts & fruits along with the spice powders makes this cake taste just awesome. 1. In a large bowl mix fruits, glace ginger, orange zest, apple puree, apricot jam and orange juice. Cover and allow to stand overnight. 2. Preheat the oven to 150 C. Lightly grease a 20 cm round tin and lin with two layers of non-stick baking paper. 3. Cream butter, sugar and vanilla extract until light and creamy. Add eggs one at a time. Add sifted dried ingredients alternately with fruit mixture. 4. Put into prepared tin. Decorate with rows of cherries. Bake for 3 to 31/2 hours. Cover with baking paper for the last hours to prevent burning. 5. Remove from oven and pour whisky on top. Leave in tin to cool completely before removing.